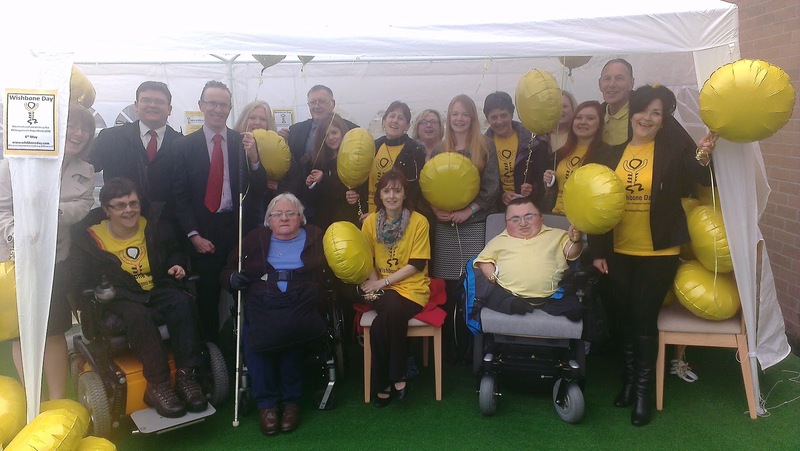 I was really pleased to join supporters and staff at the Brittle Bone Society to promote Wishbone Day. The Brittle Bone Society is based in the West End Ward and I am always very impressed with their work. 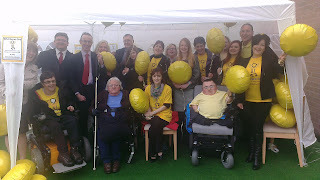 The picture shows how some of us got soaked as we got ready to let off some yellow balloons. Please have a look at the Brittle Bone Society's website and see how you can support their work. Bus Regulation Bill 2 May 2013 from West End Labour on Vimeo. I'm calling for greater regulation of bus services. My colleague Iain Gray MSP has published a consultation on a proposed Members' Bill in the Scottish Parliament on Bus Regulation. I believe that many people in my ward, and beyond, do not get the bus service they need due to a lack of regulation. I have been supporting greater action on this issue for some time. You can hear me making the case for greater regulation on Wave 102 by clicking on the video above. I support Iain Gray in his call for greater bus regulation. The City Council spends a lot of money on providing the infrastructure for buses but does not have much say about which areas get bus services. For example, a number of areas of my ward where a lot of older people live have a poor bus service. 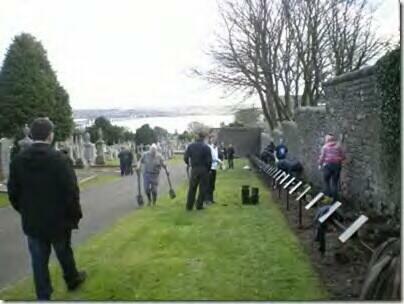 This is in areas like the Logie and Pentland estates, where eventually the council is providing a subsidised service. The bus companies operating in Dundee do not feel that they have a need to provide services which are not profitable but which are socially necessary. I think that it would be better if the council could bundle together profitable and socially useful services and franchise these together. This would prevent the 'cherry-picking' of profitable routes. We normally talk about bus services, I would question whether this is appropriate if nearly all bus 'services' are run for profit. If we are going to encourage people to use buses then we need to ensure that there is a real bus service which meets their needs. I will certainly be responding to this consultation and I will be encouraging community groups and others in the city to respond to the consultation. I also hope that Dundee City Council will be responding to the consultation. On Wednesday evening I was pleased to attend the AGM of the Community Spirit Action Group. This is an excellent group which does so much good work representing the interests of people in the northern part of the West End ward in areas like Pentland, Tullideph and Ancrum. The City Council's Director of Leisure and Communities, Stewart Murdoch, gave a very interesting presentation on the UK City of Culture 2017 bid. It was great to hear the widespread support for the plans at the meeting. The officebearers were re-elected at the AGM. I would like to wish them all the very best as they continue in their roles for another year. At the meeting I updated local residents on the work which I have done on the issue of air quality at the junction of Lochee Road, Cleghorn Road and Rankine Street. The Community Spirit Group have raised their concerns over bus services on several occasions. Their area is one which has borne the brunt of the decisions by bus operators to concentrate Bus Regulation. I think that some of the policies put forward by Iain Gray could make a real difference in areas like this. I gave the group a copy of the consultation document and hope that they might respond to it. I was pleased to join with members of the Friends of the Western Cemetery today as they welcomed volunteers from Barclays Bank who had come to do some volunteering work in the cemetery. 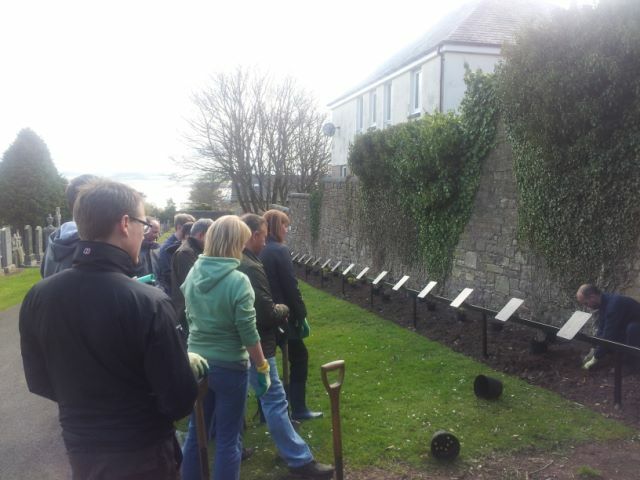 They planted some plants next to the new cremated remains area in the cemetery. It may not be the most obvious thing but it has to be said that the Western Cemetery is very much a hidden gem in the West End. The Friends group are doing a great job and I am always happy to support them. I was pleased to see volunteers from Barclays Bank helping the Friends group today and making a real difference to the area. Banks do not have the best reputation at this moment in time and therefore while it may not entirely have made made reparation it was good to see Barclays staff putting something back into the community. 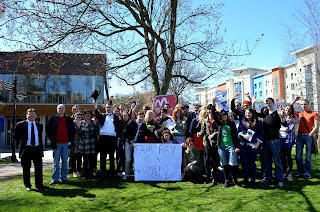 Today I was really pleased to join Dundee Labour Students, others student activists, the Movement for Change, and staff and trade unions at Dundee University to support their campaign for the University of Dundee to pay the Living Wage. I have already made clear my support of this campaign. Well done to Connor McElwaine and others for organising the event. I have long supported the campaign for a Living Wage and supported Dundee City Council's efforts to introduce the Living Wage for Dundee City Council workers. At that time I was clear that we must also support the Living Wage for all arms-length companies and contractors of Dundee City Council. I fully support the Living Wage for all public sector workers such as those who work at the University of Dundee. We should also be looking to get the Living Wage paid across every sector of the economy. I was pleased to be joined by Unison activists Emma Phillips and Phil Welsh as well as Jim McGovern MP in showing my support for the campaign by students and staff. 'Firstly, thanks very much for the opportunity to speak here today. Whatever the rights and wrongs of the issue it is good to see university staff and students campaigning together and trying to make a difference. As a local councillor for the university I am pleased to be here today and as a graduate of the university I am pleased to be here today. Fundamentally I am here today because I think that work should pay. It should pay to be in employment. The best way out of poverty is work. I campaigned over the last couple of years to get Dundee City Council to pay the Living Wage. I am pleased to say that Dundee City Council is now paying the Living Wage. When Dundee City Council agreed to pay its employees the Living Wage we also agreed to promote the Living Wage to all arms-length companies and to companies which get contracts from the council. Importantly, we also said that we would promote the Living Wage right across the city in all sectors. I support the Living Wage for all public sector workers, that includes workers at the University of Dundee. Paying the Living Wage shows that we value workers and want to give them dignity in the workplace. It is also good sense for the economy. For example the independent think tank the Institute for Fiscal Studies has calculated that for every pound spent paying the Living Wage, the Treasury saves 50p through not needing to pay tax credits and benefits. The Living Wage would put more money in the economy which would be good for the economy as a whole. The issue is should the economy be run for the benefit of the many or the few. Should we be helping bankers or helping the poorest in society. I was delighted to join many Dundonians this morning, including politicians from across the political spectrum, to send-off Dundee's bid to be UK City of Culture in 2017. 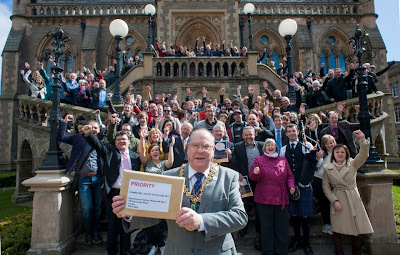 This was a great event and I am proud to put this picture here which includes, council colleagues such as the Lord Provost. I am happy to do so because this issue is about promoting Dundee, not about party politics. People right across Dundee, and beyond, have got together and are saying that Dundee should be the UK City of Culture in 2017. All of Dundee Labour Party's elected representatives have signed up to back Dundee's Bid to be the UK City of Culture in 2017. We are calling on everyone in the city to back the bid and show their support via the We Dundee website. All ten members of the City Council's Labour Group have joined together with Jenny Marra MSP and Jim McGovern MP to back the bid. I represent Dundee Labour on the Strategic Group backing the bid and I am glad that all of Labour's elected representatives in the city are backing Dundee's exciting bid to be UK City of Culture in 2017. This was a policy which was in our election manifesto and which we are proud to support. But this issue is much more important than party politics, everyone in Dundee should support the bid and tell the world just what a great place Dundee is. Labour politicians in the city will do everything that we can to promote the city and to ensure that the bid is successful. We will be working with the SNP-led council Administration to deliver the UK City of Culture title in 2017 because we know that is what is the best interests of our great city. I would urge anyone who hasn't yet visited the We Dundee website to do so and to sign up to show their support for Dundee's bid. Dundee has a strong case to be UK City of Culture and it is important that Dundonians get behind the bid. I know that the bid is also supported by many many people who do not live in the city but who know that Dundee has a thriving cultural scene. The most important message is please back our bid.